The “Party” goes on for “Days”. Who would have thunk that the band who produced big 70’s hits like “Dream On” and “Walk This Way” would be rocking steady in the 00’s? Well, these guys easily made it up my chart into the #10 spot this week. The legendary Boston band would hit my top ten once more in 2002 with “Girls Of Summer” and then wouldn’t chart again until 2012’s “What Could Have Been Love”, which got to #12. In 2001, this successful Columbia performer decided to record her first English language album, Laundry Service, after a series of big albums in Spanish-speaking territories. Not only did the effort go 3x Platinum, but this single would also got top ten on the Hot 100. On my chart, it climbed as high as #2. The singer is expected to release a new single in a few weeks and an album later this year. From the “You Couldn’t Escape It” department comes this pop/rock ballad, which took several months to break at radio in later 2001 and then just stuck around like it was glued onto every single radio playlist. AAA, AC, Alternative, CHR, Hot AC… it literally followed you wherever you would go. After a few other minor entries, the band split up in 2005, though they reunited in mid-2013. Remember when Lopez was scoring hit after hit on the pop charts? She was quite the music machine during her J. Lo days. For the second song in a row, she was assisted by rapper Ja Rule in creating a more urban image for her material and that Murder Remix was a big sell. It was yet another chart-topper for the two on the Hot 100. Lopez will be releasing a new single titled “Same Girl” soon. She ruled over the Australian and European buying public for decades, but surprisingly enough, this was Minogue’s first song to break my chart. After all, she hadn’t made the Hot 100 since 1989, and this was her first big attempt at a U.S. hit since then. Thankfully, it worked. “Can’t” would go top 5 on CHR radio and was on its way to five weeks at #1 on my survey. She last charted in early 2013. Written and produced by Linda Perry, the singer born Alecia Moore had herself a poppin’ party with a big leadoff track from her second album, Missundaztood. Released on Arista, the song went to #4 on the Hot 100 and to #2 on my personal chart, tied for her second biggest hit at the time. Three further singles from it crashed the top 5. She recently placed two songs in my top ten of 2013. Roadrunner Records already established the Canadian band at Alternative radio with 2000’s The State, but by the end of the following year, “Remind” was all over the mainstream airwaves and rising fast. It landed as the #1 Hot 100 song of 2002 and as the most played song of the decade, with 1.2 million spin detections between 2001 and 2009. They last made my chart in 2012 with “Lullaby”. In 2000, David took the U.K. charts by storm with multiple hits on the subsidiary Wildstar Records. 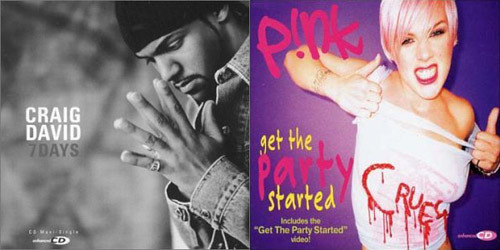 In the U.S., Atlantic Records pushed his album in 2001, which featured “Fill Me In” (#6) and this, which was peaking. Third single “Walking Away” would also go top ten before a sharp slide during his next era, charting with two minor releases, 2002’s “What’s Your Flava?” and 2003’s “Hidden Agenda”. It was the fourth and final single from their debut album on Warner Bros., Hybrid Theory, and the California band did not disappoint. Mixing rock and rap, “End” remains their biggest song to reach my chart. Surprisingly, they haven’t made my top 40 since 2004 when “Numb” peaked at #3. They recently ranked on the Alternative survey with a Steve Aoki collaboration, “A Light That Never Comes”. Interscope’s darlings had one of the big Q4 album releases of 2001 with Rock Steady, and steady it was, producing three significant hits on my top 40 and earning a 2X Platinum certification. This was the first, at #1 for its second of three weeks. They would go back to the top one last time in 2003 with “It’s My Life”. After an unfortunate failed comeback in 2012, the band is back on hiatus, though lead singer Gwen Stefani is in the process of recording a third solo album, her first in eight years. We’ll see how it turns out. From now until New Year’s Eve, I’ll be counting down my top 100 songs of the year. Every week, I make a top 40 list, and each position gets a certain amount of points, plus, I add in some extra points for weeks at #1, which goes towards their yearly total. The survey period is from December 4, 2011 to November 25, 2012. Ties are broken by (1) peak position, then (2) weeks at peak position, and then (3) number of weeks on chart should it go that far. We’ve got 70 more songs to count down, so, what am I waiting for? Let’s pick it back up at #70. Eighteen of Billboard’s Dance Club/Play number-one singles made my top 40 this year, peaking on that chart and my own within two weeks of one another. It also hit #1 in Australia and in the United Kingdom. This one peaked at #11 for three weeks at the chart year cutoff, but it has since climbed to #8. On their own, both artists have hit #1 on my chart; Lifehouse took “Whatever It Takes” to the top in 2008 and Bedingfield did it with “These Words” in 2005 and “Unwritten” in 2006. Williams made a major comeback in the United Kingdom this year when this single became his first #1 hit since 2004. His album, Take The Crown, also took the top spot. He’s touring the U.K. with opener Olly Murs, who has two songs coming up in the top 50. Though it ended the chart year at #6, the song went onto peak at #4 a few weeks ago. After two #3 hits during his last era, Battle Studies, this one struggled up to a peak of #16 before falling off the radar. This era was plagued by Mayer’s throat condition, which led to a canceled tour and limited promotion for his album, entitled Born and Raised. The first ever American Idol winner did moderately well with this third single that slowly crawled up my top 40. All three of them made the year-end chart. It was recently covered on the television show Glee. This one-woman band, originally born in Wales, made her debut on my chart this year, reaching its peak back in July. Second single “How To Be A Heartbreaker” just missed the top 100. Parent album Electra Heart hit the #1 spot on the album chart in the United Kingdom. “Know” was my #57 song of 2011 and ended up with about 90 more points in that position. It was the third song to make my chart to address a Mr. in the title, following “Mr. Bartender (It’s So Easy)” by Sugar Ray (#17, 2003) and “Mr. Brightside” by The Killers (#1, 2005). “Someone” peaked at #1 way back in October 2011 and was the #13 song of last year. It’s from her now Diamond-certified album, 21, which sold ten million copies in the U.S. alone in less than two years. 700,000 copies in sales the week after she won the Grammy Award for Album Of The Year didn’t hurt either. They may be one of the most hated bands in the world, but that didn’t stop them from placing two songs in my year-end top 100. This peaked at #2 in November 2011 and was my #67 song of that year. The proper comeback that was supposed to be the Lotus era has not lived up to such high expectations and the downward spiral of Aguilera continues. Just like “Not Myself Tonight”, the leadoff single from Bionic, this peaked at #10. Aguilera is taking a break from The Voice during its next cycle. The duo of Amy and Nick strike again with their second of three songs in the top 100. This was the fourth song to make my top 40 with “hello” in the title; compare that ten that charted with “goodbye”. Their only top ten hit on the weekly chart is somewhere in the top 40 of the year. Here’s the second act in a row from Boston, a legendary band that’s been charting since the 1970’s. This was the first mainstream single from Music From Another Dimension. One of the co-writers of the song, Russ Irwin, is a one-hit wonder on the national scene; his only charting single, the ballad “My Heart Belongs To You”, reached #28 on the Hot 100 in the fall of 1991. The first ballad single by the band proved to be a front-loaded single in the United Kingdom, debuting at #3 but crashing downwards fast. It just missed the top ten on my chart. Whataya know? We have back-to-back One Direction tunes in the countdown. “Beautiful” peaked at #3 for two weeks in October 2011, but gained a little bit of ground back when a Stateside release of the single was announced. It ended up with a total of 28 weeks in the survey. Two more songs by the band will set you in the right Direction soon. This was the only song written from a movie soundtrack to hit the top spot on my chart this year. However, it’s not the highest one in the year-end top 100. She has one more song to go, which is quite a bit higher. We’ll be back tomorrow on Christmas Eve with #55 through #41 on the chart, including two more movie hits, another high-profile flop, and a little bit of royalty on our way to the throne and the #1 song of 2012. Sometimes there are just so many new singles out there, you can’t keep up! We all know that two is better than one, and these three new duets going to or currently at radio prove it. They’re all on the lighter side of the spectrum, but they also provide a worthwhile listening experience. Once the Christmas rush is over for the year, here are three sizzling soft-rock duets to keep on your radar as we going into 2013. Taken from the soundtrack to the forthcoming movie Safe Haven, this collaboration between Caillat and DeGraw is a lush piano-based ballad, with some additional strings accompaniment. The two have never collaborated on a single together, yet they sound like they’ve been duet partners for decades. Honestly, this kind of track could have come out in the 90’s and been a huge national success. Not sure how far it can go in today’s music market, but the names will certainly help it along. Between this track and another on Caillat’s recent release, Christmas In The Sand, I guess they’re making up for lost time. For all I know, they could be the new Carly Simon and James Taylor if they keep putting out consistent work for a few more years. (Just don’t tell that to Taylor Swift and Jason Mraz.) The song tells of a couple who have been separated for some time, but now, are taking the steps to reconnect. They sing together, “We both know our own limitations and that’s why we’re strong.” DeGraw sings about letting go of events in the past, while Caillat appeals to her partner that they should “wait and see the light.” They pull it off effortlessly. One of the highlights is a dramatic middle eight, with a tight and tense arrangement as the two performers croon about how dreams “can take us further that what anybody can see.” I suppose I’m not the right audience that would become emotional hearing this kind of song, but in the context of the movie, it may make for a powerful statement. It’s absolutely beautiful. I don’t know why they don’t collaborate more often. They’ll be singing this song together for the first time live on The Today Show on New Year’s Day. Check your local listings for the correct time. Buy “We Both Know” on AmazonMP3. Some charts just get lucky sometimes. One of the more tender moments on the Boston band’s new album is this slower song with one of the reigning queens of country music, Carrie Underwood. “Stop” is the followup single to another downtempo single, the mid-charter “What Could Have Been Love”, which easily could’ve been a reject from Aerosmith‘s last original studio album, Just Push Play. I can basically say the same for this one, though the overall result is a little bit stronger on this record. Tyler is down and out of luck and love; it’s as if he “fell from holy Moses mountain, where love’s a slippery slope,” but he finds a girl in Underwood’s character, a “wild…mountain child” and they begin to embrace one another. Underwood then speaks about her “old timey cowboy”, though she seems to suggest that a first kiss with her newfound lover doesn’t sit right with whatever kind of relationship status she’s in: “And for all it costs, for getting lost, there ain’t no better sin.” Does she have a regular boyfriend or is it just creepy that Tyler wants Underwood with the whole age difference? Pick your choice. In the end, they spend the night together, and that’s about as far as it goes (at least in lyric.) It’s the classic Aerosmith sound, lots of guitar and drum, with not too much twang to drive it in a more folky direction. It’ll strictly be an adult contemporary hit. I would hope it can be one of Underwood’s stronger placings on the survey considering that the appeal of the song isn’t limited to solely a country audience. Whatever happens, both of them will still sell records individually; that’s something they certainly “can’t stop”. Buy “Can’t Stop Lovin’ You” on AmazonMP3. 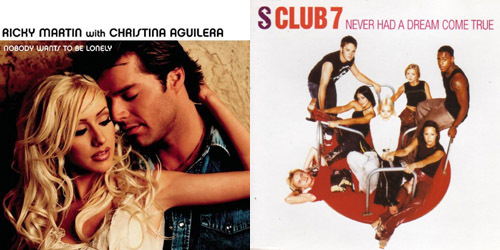 The dance sound isn’t paying off for Christina Aguilera as evidenced by two leadoff singles that had very front-loaded sales and a very short chart life afterwards. Now, the chanteuse and her label have decided to release a hybrid country and pop ballad, which features fellow The Voice judge, Blake Shelton. This is a much more natural direction for Aguilera. No synthesizers, no overly promiscuous lyrics, just a simple out-of-love song with some bare bone guitar and drums to back her and Shelton up. Aguilera’s character finds herself lonely at the bar, trying to forget the pain of a relationship gone awry as the result of infidelity: “I waited and waited so long / For someone who’ll never come / It’s my fault to think you’d be true / Yeah, I’m just a fool.” Shelton’s character wants to move on, but hesitates at the thought of rekindling what he and Aguilera’s character once had. They deliberate, but ultimately, in the end, the two of them don’t give into their weakness and stay apart. This is really a true ballad; they are both so vocally expressive and that’s what makes the song great. It’s smooth, but edgy: can’t help but get some goosebumps when Aguilera starts to wail out. Yes, it might be a tad better if it wasn’t so forced, but that’s the point of a slower song. It’s glossy and strives for perfection, and so, Aguilera and Shelton have done the best they can. Already gaining some adult contemporary and pop airplay, the big question is, will this transition to the country airwaves and become a charting hit there? With some initial unsolicited airplay on the format at the moment, this could be the big breakthrough to come out of an otherwise generally forgettable era. Thank goodness they’re not foolin’ around with this song. Buy “Just A Fool” on AmazonMP3. Do you have a favorite of the three duets? Like one that I didn’t mention? Let me know in the comments or on Twitter: @AdamFSoybel.